Thandai/Sardai is a very delicious cold drink made during Holi festival. 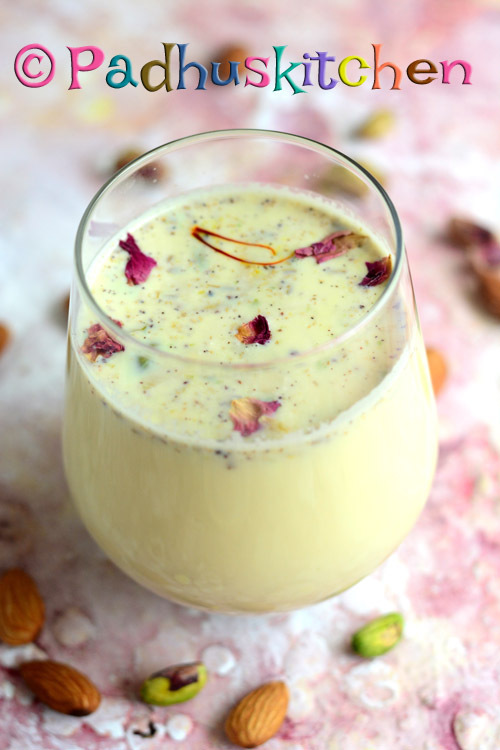 It is prepared with a mixture of almonds, pistachio, whole peppercorns, fennel seeds, melon seeds, cardamom powder, saffron, milk and garnished with dried rose petals. Last year I wanted to make thandai for holi but could not make it. This year made it at the last minute. I got this recipe from North Indians living here but adjusted the ingredients to suit my taste. The result was awesome. It tastes best when chilled. Today we will learn how to make Thandai following this very simple and easy recipe. Boil milk, add sugar and mix well until it dissolves. Leave it to cool. Soak saffron in a little hot milk and set aside. Once milk is warm, mix the saffron flavored milk with the rest of the milk. Soak cashew nuts, pistachio, almonds in hot water for 1-2 hours. Soak khus khus also in hot water separately. Remove the skin of almonds and pistachio. Then grind everything together with a little milk along with khus khus to a paste. Set aside. Grind cardamom (discard the pod), whole black pepper, cinnamon and fennel seeds to fine powder. (I have used 1/8 tsp cinnamon powder in place of cinnamon stick). Now add the ground paste, ground powder to the milk and mix well. Garnish with dried rose petals. Refrigerate for 2-3 hours and serve chilled. Thandai tastes best when served chilled. Enjoy making thandai this Holi. Superb recipe . Will definitely try . Melon seeds are available easily ? I did not use melon seeds. It will be available in super markets. Thank you . Ok will try and let u know the outcome .